When Corazon Soliman was picking her way through the wreckage and bodies left by Supertyphoon Haiyan in the Philippines last year, a thought kept occurring to her. “Why didn’t we use the term ‘tsunami’?,” the country’s social welfare secretary said. The Philippines’ disaster planning officials had a pretty good idea of what was coming their way—the strongest storm ever to make landfall. They knew that storm surges propelled by winds of up to 315 kilometers per hour could sweep across low-lying areas and pose a significant threat to life and property. The problem, though, is that people on the ground weren’t familiar with what a storm surge entailed. In all, more than 6,300 people perished in Typhoon Haiyan, most of them killed by storm surges. But as Typhoon Hagupit, locally known as Typhoon Ruby, lashes the country, Filipinos are in no doubt about what the term storm surge means this time. Hundreds of thousands of families sought safety in evacuation centers across a broad swath of the Philippines, shaken by the still-fresh memories of what happened last year. Initial indications suggest the loss of life is substantially lower this time around, partly because of the precautions taken. A government spokesman described early reports of the situation as “encouraging.” Moreover, the country’s disaster-planning experts have devised a sophisticated storm surge simulation map, which anyone can access to see where the most at-risk areas lie. Spearheaded by a boyish disaster-planning scientist named Mahar Lagmay, the modeling maps are developed by Project NOAH, a government agency that looks to find innovate ways to technology to help one the world’s most disaster-prone nations better prepare for calamities such as earthquakes, volcanos and landslides, as well as the 20 or so typhoons which careen through the archipelago each year. People clicking on the website, will be able to see high-resolution simulations of how their neighborhoods will be affected by the storm’s path, and, crucially, where the safe evacuation zones might be. The maps work by using LIDAR technology—or Light Detection and Range—to beam lasers on objects and gauge distances by their reflection. These will place local landmarks clearly on maps, which will also forecast the times of the peak water heights. In the days following Typhoon Haiyan last year, Mr. Lagmay and his team tested early versions the modeling system and found the results were a close match to the actual devastation caused on the ground by the killer storm. It was something of bittersweet success, though: The scientists lamented that their maps could have saved many people who didn’t know where to go to escape the worst of the storm. “We should have done this years ago,” Mr. Lagmay, who is also a professor at the University of the Philippines, told a seminar in Manila last month. Other countries are also working on improving storm surge forecasts, including the U.S., where the National Hurricane Center this year introduced an experimental map for the East and Gulf Coasts, and Mr. Lagmay’s team is working closely with them to beef up the Philippines’ own storm-surge advisory system. Last year’s disaster, however, jolted the Philippine government into providing Project NOAH the financial and institutional backing it needs. As a result, Mr. Lagmay’s team in recent months has managed to upgrade it to provide detailed information as much as 36 hours before a storm hits, and issue alerts based on the size of the projected surge. More than 50 of the Philippines’ 64 coastal regions have been mapped, including all of the provinces in the typhoon corridor running through the heavily-populated central islands of the country. 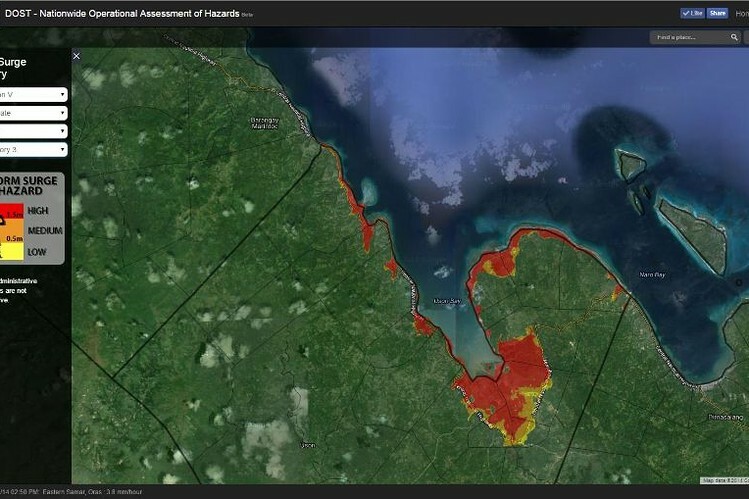 Among the at-risk zones on Sunday morning’s version of the map, for instance, Project NOAH warns that coastal areas of the town of Baleno on the northwest side of Masbate island are facing a storm surge of some 1.5 meters in height, relatively mild compared with the 4 meter plus waves forecast in some other parts of the country. An estuary and surrounding areas are highlighted in red, while the zone around are colored yellow, to show the risk is less in those places. While the technology might be helpful, the trick, some officials privately say, is to get local leaders on the ground in vulnerable areas to pay attention to all the disaster planning resources at their disposal. The Philippines, like the U.S., provides a lot of autonomy to local governors and city mayors, so this isn’t always easy. While some bosses such as Albay Governor Joey Salceda have embraced disaster planning for years—as well as he might, given that his turf is home to the Mayon volcano as well as sitting on the Pacific side of the Philippines’ typhoon band—others haven’t. In some parts of the country, officials are chopped and changed during frequent election seasons. That means that it can be difficult to develop an institutional knowledge of simulation mapping and other new disaster preparedness techniques. “So last summer we went on a big campaign, all over the country to teach all kinds of officials about what we’re doing, all the way down to the barangay, or village, level,” Mr. Lagmay said. The Philippines’ broadcast and radio networks have embraced the concept of storm surge warnings, though, encouraging Filipinos to seek out the forecasts for themselves or publishing Project NOAH’s storm-surge advisories on their websites. Mr. Lagmay has been in hot demand, too. On Sunday he conducted a series of radio and television interviews warning about the dangers of storm surges. This article was originally published on The Wall Street Journal website on December 7, 2014.